New day, new Invitational entry. This time let us share David Coombes’ fantastic trio wih you. This is excellent, I really get that Rogue trader vibe but with modern models and painting techniques. There’s just the right amount of bizarre and grotesque in these pieces. They could have come from a white dwarf of the old days. The surfing City Guard is my favourite! Wow I was not prepared for this at all! From the WiP round this didn’t really catch my eye but now that has definitely changed – love it! Rogue Trade 2015 edition! Excellent old days feeling. As a child of the eighties I absolutely, unabashedly, love the Gizmoduck conversion! Brilliant in concept and execution!! 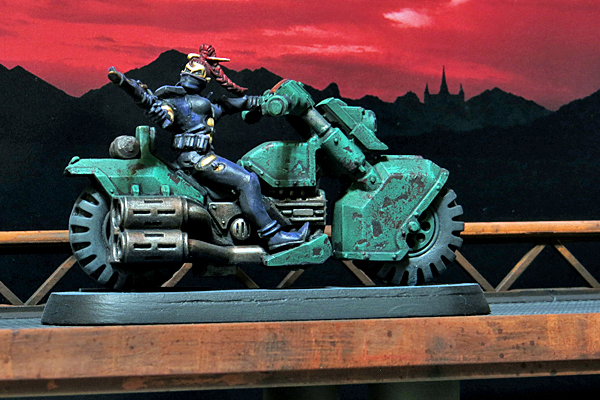 The painting on the whole group is spot on – I´m particulary fond of the weathering on the bike. 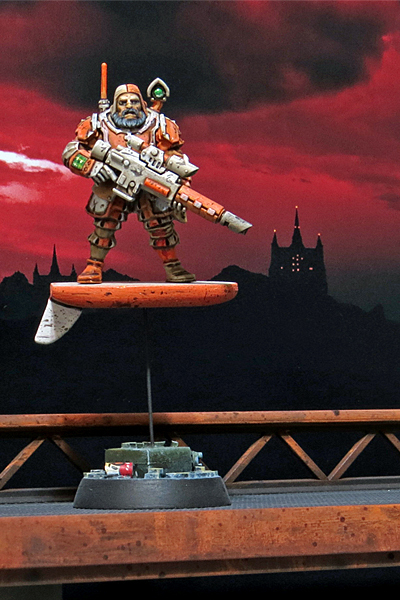 Only crits would be that the assassin is still a bit too much of a obvious dark eldar to me and the guards hover board, which looks sort of tacked on. He´s not bracing himself like he actually riding it. Great and original job ! This is so cool! Great color palette too. Very much looking forward to seeing more of David’s work. Great work all around. 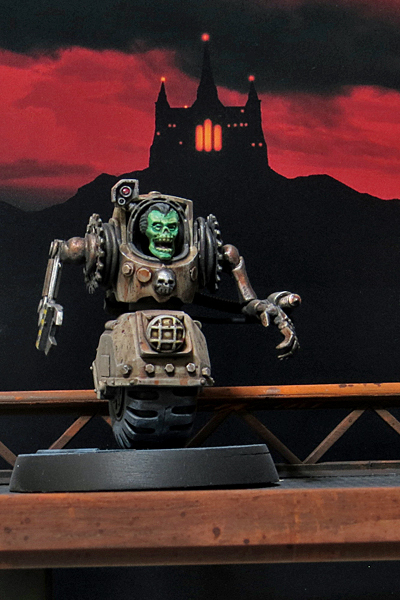 The weathering on the bike is great, the Machine Cultist is a lot of fun, and the paint on the Guard is fantastic. I so miss hoverboards from 1st edition – glad to see it make an appearance here. Really very nice work! Very inspirational. I really like all three of these models. They really remind me of the old Contra videogame series. Arcade run ‘n gun shooters. Lots of crazy science fiction action. Motor bikes and hover boards and all. This is quite an awesome entry! 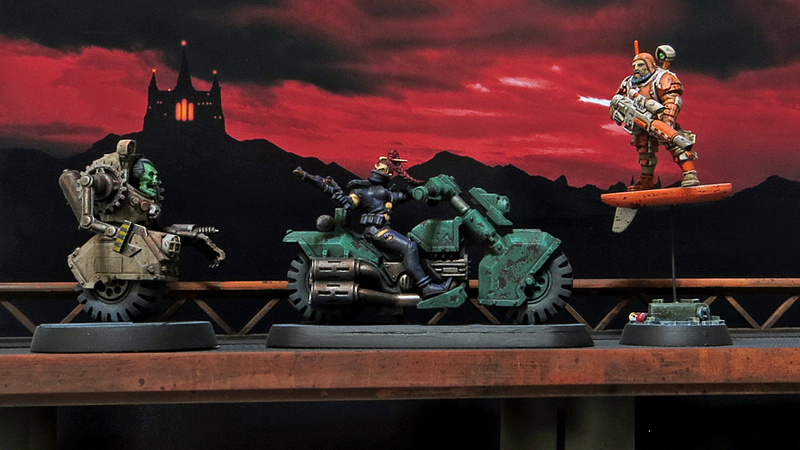 Each model has an excellent sense of motion and momentum, allowing them to fit together into a cohesive scene. The vibrant, yet dusty colors add to the dystopian, comic-book feel of the models. I really like the photography too (the background tile adds a lot to the vignette)! Three different ways of transportation. Excellent. I especially like the alternative colour tones as well as the weathering and battle damage. Hey Guys, I want to say how thrilled I was to see my humble models in such esteemed company. I had a blast working on them! And yes, I’m definitely of the 2000AD generation, I started painting in 86. Thanks to the ironsleet guys for organizing such a cool event and to everyone for the kind comments!